We’re putting the spotlight on Celine Tarrant. Celine is a young professional and social entrepreneur. By day, she works in pricing strategy at a Fortune 100 Company. After hours, Celine is the founder of Smart Girls Sweat, a Toronto-based “sweatworking” organization that empowers professional women through fitness. She is a graduate of the Bachelor of Commerce program at Queen’s University. Where did you attend school? I attended Queen’s University where I studied Commerce. What does “SheShines” mean to you? “SheShines” highlights the experiences of young women so others can learn from them and be inspired to take on their own challenges and achieve their own goals. How would you describe yourself in under 140 characters? Hardworking & ambitious professional. Passionate entrepreneur. World traveler, fitness enthusiast, &coffee lover. Aspiring #girlboss! What did you enjoy the most about your university experience? Looking back at my time in school, the highlights that stand out most were my experiences outside the classroom. I loved my extracurricular activities including my executive roles on Queen’s Women in Leadership and Queen’s Conference on Philanthropy. My international experiences were definitely highlights as well, including my semester abroad in Germany and volunteering with a group of Commerce students at a rural school in Nicaragua! On top of my full time career, I recently started Smart Girls Sweat. Smart Girls Sweat is a Toronto-based “sweatworking” organization that empowers professional women through fitness. 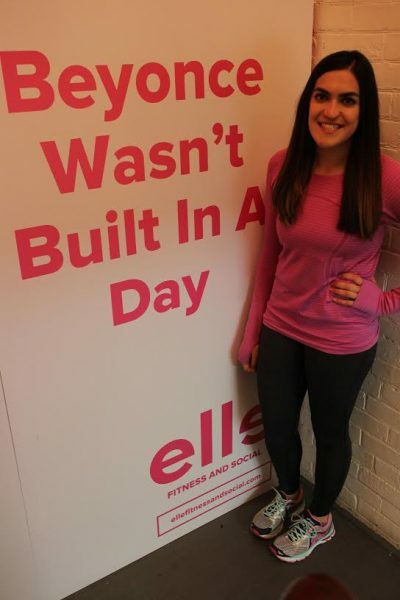 Combining fitness classes, keynote speakers, and networking, Smart Girls Sweat creates unique experiences that cater to the health-conscious professional woman. I also run, practice yoga, and love to try out new fitness classes and sports. I’ve been encouraged by my peers and mentor to share my experiences with a wider audience, so started writing about careers, wellness and networking. You can read me on TheMuse.com, Newsweek, Best Health Magazine, the Metro and TalentEgg.ca. What accomplishments or activities are you most proud of? I’m definitely most proud of starting Smart Girls Sweat. It has been an amazing learning experience to run a business on top of a full time job! I’ve had the opportunity to meet some incredibly successful women who have been my speakers, sponsors and mentors. I’m also proud of my running achievements. 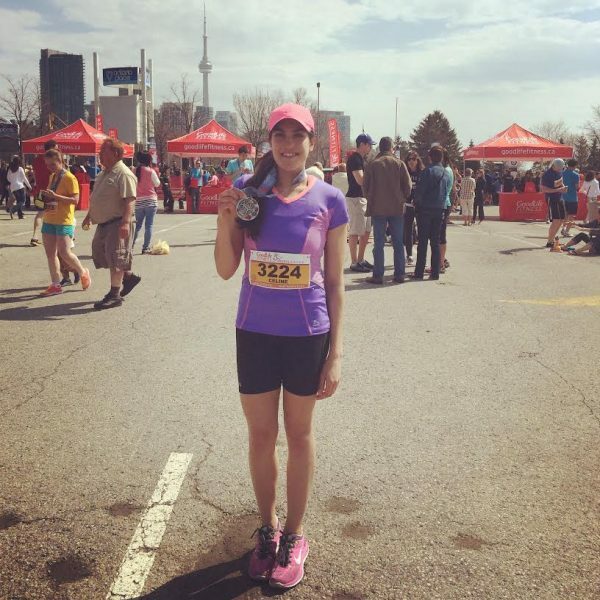 I went from being a total non-athlete to having run 3 half marathons in less than two years. I’m currently training for my first full marathon, and I imagine that crossing the finish line will be my proudest moment yet! What do you do to keep your stress level managed? Usually a hard workout and some chocolate will do the trick! Intense workouts like HIIT classes, sprints, and spin classes usually tire me out too much to feel stressed. I’ve also learned that stress is par for the course for any ambitious, hardworking person. It’s okay to feel stressed sometimes, and rather than trying to control it, I try to just ride the wave. I know that on the other side of that stress is an achievement or result that I really want and it will be worth it in the end. Having graduated and started my career, my next career milestones are to get my MBA at a top school and continue to grow Smart Girls Sweat. My personal goals are to complete an Olympic distance triathlon, and run a destination race somewhere tropical! What do you believe is the biggest challenge women face today? Some of the major social and economic challenges that women face today including lack of equal pay, lack of adequate parental leave policies and lack of affordable child care. “Full-time employed women earn 19% less than their male counterparts, [of which] mothers 25 to 44 years old suffer the largest gender wage gap” (Catalyst, 2015). We need better salary transparency in more organizations to highlight those gaps. Women hold only 35.5% of management positions and only 33.3% of senior management roles (Catalyst, 2015). While Canada’s parental leave policies are better than our neighbours’ to the south, they are still far from perfect. Without specific time off allocated to fathers, the number of men actually taking paternity leave will remain low. This decreases female participation in the workforce and prevents women from progressing into managerial roles. Additionally, exorbitant child care costs in most of the country drive women out of the workplace or force them to remain stagnant. What progress do you see in this issue? There has been progress made in getting women into the workforce (47.2% in 2015 vs. 37.1% in 1976 in Canada according to Catalyst), but not enough progress in getting women past middle management level into C-level positions and board seats. We’ve seen some progress in getting more men to take leave when their children are born, but with only about one in 10 fathers taking leave in Canada (Macleans, 2015), it’s not enough yet! If you had to leave one message with young women, what would it be? You have to ask for what you want! Don’t be afraid to ask for opportunities. No one is going to hand you anything, so you have to ask for bigger jobs, more responsibility, more money, and new experiences. The worst that can happen is they will say no and you’ll be able to use the experience to improve yourself and ask again in the future. What gives you the biggest FOMO: When my friends bump into famous or interesting people when I’m not with them! What inspires you to continue to do great work? When someone tells me that something I have done has made their life better! It pushes me to keep doing more even when I think there’s no way I’ve got enough time or energy. When you hear the word ‘successful’ what’s the first thing that comes to mind? Doing something that makes you happy and has a positive impact on others. Anything else you want our reader to know about you, what you’re doing or a final message you’d like to leave them with? Don’t take things too seriously! Work hard, strive to be a good person, surround yourself with good people, and don’t give up on your goals! UniversityHub.ca is a professional social network for students in Canada. It’s the number one place to plan your future and connect with other students in the same boat as you. SheShines is a movement co-led by UniversityHub and Faze to put the spotlight on young women leaders. Nominate a SheShines leader by emailing editor@faze.ca.